Version 2 of the API needs to be integrated with Evergreen so that copies of a title that have been purchased by member libraries through their OverDrive Advantage accounts are accounted for in the display of available copies. Currently, these copies are not represented in the total number of available copies. Version 2 solves these problems. Related to the above bug report, if a title was purchased by a member library through their OverDrive Advantage account, but was not purchased by our consortium (NOBLE, Inc.), the catalog indicates that no copies are available. Note: in some cases the display indicates “status: null of null available” and in others “status: 0 of 0 available”. A screenshot is attached. Another example related to the bug report. If copies of a title have been purchased both by NOBLE, Inc. and by one or more libraries through their OverDrive Advantage accounts, the copies purchased by the libraries do not display in the catalog. A screenshot is attached. 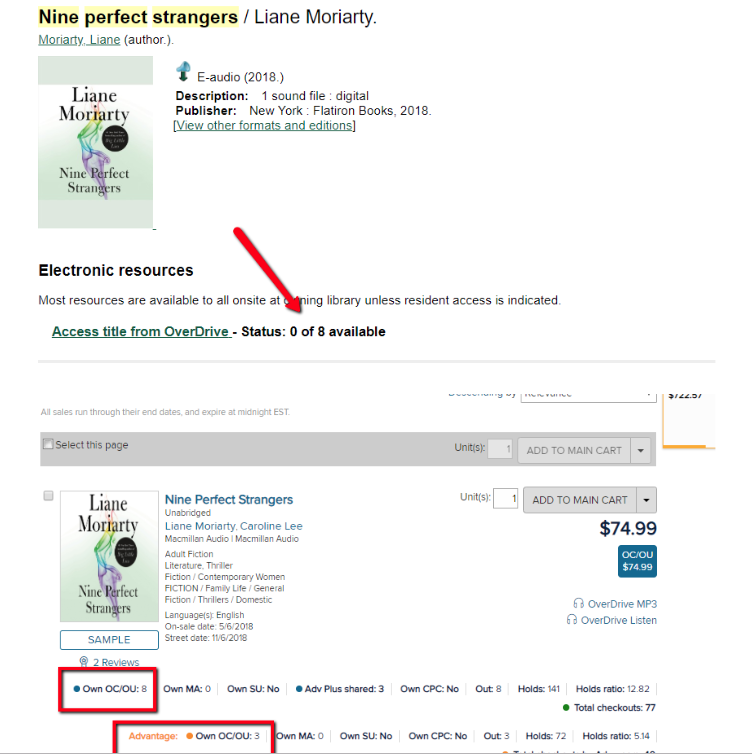 In this case, NOBLE owns a total of 11 copies of Nine Perfect Strangers; 8 purchased by the consortium and 3 through libraries' OverDrive Advantage accounts.